The Lucille Butterworth cairn alongside the Lyell Hwy. 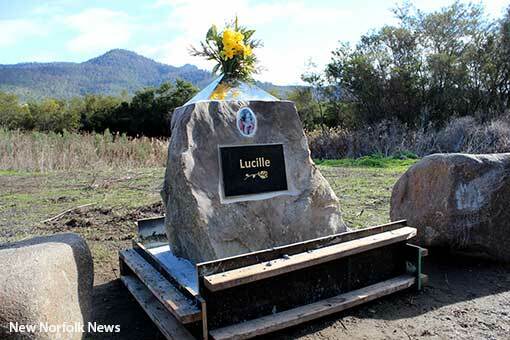 A CAIRN in memory of Lucille Butterworth has been erected at a site along the Lyell Highway this weekend. The site between Granton and New Norfolk is where police two years ago conducted a two-week dig for clues into the 1969 disappearance of 20-year-old Miss Butterworth. Miss Butterworth's remains have never been found but Coroner Simon Cooper last year found that she had been picked up and killed by Geoffrey Charles Hunt. Despite the coronial finding, the state's Director of Public Prosecutions declined to press charges due to a lack of admissible evidence. The Butterworth family recently unveiled a new memorial to Lucille at Claremont, opposite the Main Rd bus stop where she was last seen. That memorial takes the form of an illustrated storyboard. The monument at the Lyell Hwy site is a large stone featuring a plaque, a photo of Lucille and personal messages from her brother James. You were the brightest soul, never given a chance to grow old, but rest in peace my Lucille. You will forever shine brightly in my heart and memory. I tried my utmost to bring he who took you from me to justice, however he has been named and shamed but no justice for you. He may walk free but while there is breath in my body I will pursue the justice he so deserves. I would love the chance to dance with you again, see you smile again. I don't want to say goodbye. My little sister you were a beautiful Rosebud not allowed to bloom. Your ever loving brother, James. Was removed from the West Hobart Quarry now closed. At the quarry in 1922 our grandfather Tasman Butterworth was killed by a falling rock and I saw it fitting to use a piece from the quarry for this Monument. Memorials pay respect to the departed, but they are really for the living. They contribute positively to the grieving process by providing a sense of place and leaving a tangible record of a life lived for family, friends and future generations.